The background rumble of trains on the London Underground passing beneath the hall can be heard on several of the great classical recordings made in the Kingsway Hall in the 1960s and 70s. I was reminded of this when recording the interview for my recent David Munrow on the record programme as I could hear the 21st century equivalent of Underground trains in the form of low frequency hip hop rhythms coming through the 'soundproof' window from the adjacent studio at Future Radio. I decided to ignore the breakthrough as it was not too obtrusive, and I was also mindful of the numerous potentially degrading links in the distribution chain that the programme would go through before reaching the final listener. But I was still thinking analogue, and had seriously underestimated the resilience of programme content in the digital domain. When I listened to the broadcast of the interview live from the audio stream on KEF monitor quality speakers at home the breakthrough could be heard, although it certainly didn't detract from a very interesting programme. More surprisingly the hip hop rhythms can also be heard on the podcast of the interview, despite a multi-stage distribution chain and the file using the 'intermediate' iTunes encoding sampling rate of 44kHz and mp3 bit rate of 256kbps to contain download time. That distant hip hop beat highlights the new challenges posed by digital distribution. I have already written here about the difficulties associated with webcasting classical recordings with wide dynamic ranges. This problem was brought home again while working on this Sunday's Elisabeth Lutyens programme with James Weeks. When Lutyens specifies ppp Exaudi directed by James Weeks sing ppp, and NMC's recording engineer Andrew Post digitised that ppp. Exactly as it should be, until listeners switch off when the broadcast/webcast programme content is submerged under background noise. The same problem was experienced when testing the audio stream for the complete Inner Cities webcast. I mentioned this to pianist Daan Vandewalle who replied that the reason why some passages were very quiet on his recording was because he played them very quietly! Today, artists generally feel they have to master their records to be as loud as everybody else's. This certainly works for many artists. However, there are many other artists who feel their music would be better served by a more dynamic record, but who don't feel like that option is available to them. This all comes down to the moment a consumer hears a record, and the fear that if the record is more dynamic, the consumer won't know to just turn up the volume. This is an understandable concern, and one Turn Me Up! is working to resolve. You can hear (or perhaps not hear) Lutyens' ppp writing on Future Radio this Sunday Jan 13. There is no hip hop background but listeners with high quality speakers may hear the door of the adjacent studio closing a couple of times. The following Sunday the opening of the 1995 recording of Luigi Dallapiccola's Canti di prigionia performed by Ensemble InterContemporain and the New London Chamber Choir will also test the signal to noise ratio of the whole digital distribution chain. Hip hop accompaniment and doors slamming regardless, I am very grateful to Future Radio for allowing me to use programme time as a sonic sandbox. They have also been extraordinarily helpful in tweaking the audio stream quality to accomodate the extremes of dynamic range found in contemporary music, and the dreaded silence detector is currently off. Norfolk, UK is becoming something of a hotspot in the recording world, and a state of the art rock studio has just opened a few miles from where I live in rural Norfolk. Leeders Farm recording studios are close to where Sir Malcolm Arnold spent the last years of his life. Which allows me to back link to a relevant post which brings together the different worlds of rock and classical music. Header photo is NOT the Future Radio studio! It is Castle Sound in Scotland, which, I am sure, doesn't suffer from sonic breakthrough, although those speakers may cause the engineer to go deaf instead. Any copyrighted material on these pages is included as "fair use", for the purpose of study, review or critical analysis only, and will be removed at the request of copyright owner(s). Report broken links, missing images and errors to - overgrownpath at hotmail dot co dot uk. Email received from Dan Nyman, who is head of production at Future Radio. I’m very interested in the Turn Me Up site. I’ve been following the Loudness Wars debate for a few years now, as it’s been a topic that’s surfaced regularly on a music technology forum I frequent. 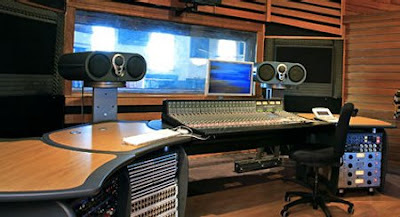 The real sea-change came with the arrival of powerful digital limiters in the mid 90s, which allowed mastering engineers to raise the average energy of tracks with fewer obvious distortions of the signal. Sadly industry execs got excited about how ‘hot’ they could get tracks with this technology, and now it seems mastering engineers are under pressure to limit the bejesus out of everything! My girlfriend bought a ‘digital remaster’ of a Blondie album recently and I had to get her to switch it off in the car after only a couple of tracks because the remastering job had smashed the dynamic range so much that it was just too fatiguing to listen to after a few minutes. Horrible. Compression and limiting can be very useful and creative in music production, but they definitely are tools which to which the old adage of ‘you can have too much of a good thing’ applies! Compare it with playing live Music. Ever heard a better version of Janaceks “Intimate letters” than the one performed live ( 1993 in Mozartsaal / Vienna) by the Alban Berg Quartett? Good point Bernard. But it doesn't need to be a live performance to have some good old-fashioned 'noises off'. Sometimes these noises off can be quite lovely additions. I was at concert with Ensemble 10/10, Liverpool's contemporary music group, a few years back when near the end of an incredibly intense piece, an ambulance drove by sirens wailing. The timing was perfect and it made the piece seem even more poignant.